Hearts finish their season with a trip to Rugby Park to face Kilmarnock, Matt Farnham previews. 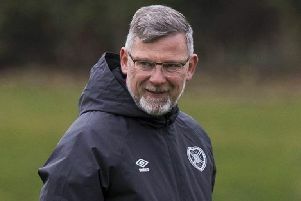 Craig Levein is looking to end Hearts’ 2017/2018 season on a high by recording a second win in a week with victory over Kilmarnock, but has been hampered by a lengthy injury list. Fans were left delighted on Wednesday when the team defeated Hibs 2-1 at Tynecastle, but it did come at a cost with a spate of injuries. The Hearts boss is mystified at the extent of the injury issues. Levein hoped that a request to the SPFL would see a collection of players on developments loans recalled and made available but the league denied the club’s appeal. There are 15 players available, with three of those being goalkeepers, with “a number of really young players” in the squad. He is hopeful that left-back Mitchell and striker Lafferty will be able to play through the pain barrier. The latter is aiming for one goal to take him to 20 goals in all competitions, becoming the first Hearts player to do so since club legend John Robertson in 1991/1992. Hearts have won once away from home in the last 13 outings, a 3-0 win over Hamilton Academical back in January. With such a squad predicament it is nigh-on impossible to predict how Hearts will line-up, let alone expect the team to overcome a Killie side who have been rejuvenated by Steve Clarke since the former West Brom boss took over in October 2017. The Killie boss has his own selection issues to contend with. Midfielder Gary Dicker is suspended and Jordan Jones, Rory McKenzie and Steven Smith all unavailable, although Alan Power could return. They have performed above expectations this year and will finish in fifth place no matter the result. They displayed a resolute and determined defence against champions Celtic in midweek. It means that since Clarke’s arrival Killie have lost only once in seven matches with the Old Firm. He admitted that the team will be more attacking at Rugby Park as they look to win their first game of the split. In Kris Boyd they have the league’s top scorer with 18 goals and no team has been on the end of more of his goals than the Gorgie side. Last five meetings: Hearts 1-1 Kilmarnock, Hearts 1-2 Kilmarnock, Kilmarnock 0-1 Hearts, Kilmarnock 0-0 Hearts, Hearts 4-0 Kilmarnock. Likely Hearts team (4-4-2): McLaughlin; Cowie, Hughes, Chris Hamilton, Mitchell; Moore, Cochrane, Callachan, Milinkovic; McDonald, Lafferty. Likely Kilmarnock team (4-4-2): MacDonald; O’Donnell, Findlay, Boyd, Taylor; Mulumbu, Tshibola, Power, Kiltie; Boyd, Brophy.